After the death of an old army buddy, Cooper travels to Thunder Point, Oregon determined to find out what happened. While there he learns that his friend has left him a run down bait shop and a large parcel of pristine beach front land. But Cooper is a wanderer at heart and settling down isn’t in the plan. Sarah is a U.S. Coast Guard helicopter pilot. She moved to Thunder Point to escape her cheating ex-husband, not so easy to do when you work out of the same base. His betrayal was so deep that she can’t trust any man and especially someone like Cooper who freely admits he has commitment issues. But as Cooper steps in and helps Sarah’s brother who is facing bullying at school, she finds herself drawn to him. Robyn Carr doesn’t just write romance novels, she writes whole communities. 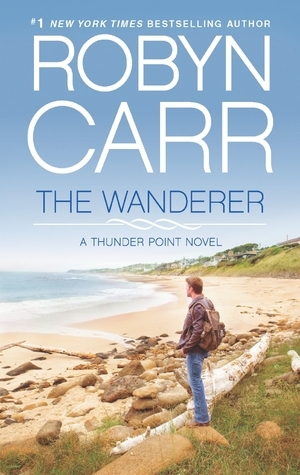 The Wanderer centres around Cooper and Sarah, but it’s in no way only about them. Characters and story lines are introduced which will come into focus in future books. It’s one of the things I love the most about Robyn Carr’s writing. Stories don’t just end on the last page of the book, we will revisit these same characters in each book in the series. I found this book to be a little busy in the first couple of chapters but after that it settled down into an intelligent story about ordinary people trying to make their way in the world. This entry was posted in Uncategorized and tagged chick lit, contemporary romance, Robyn Carr, the wanderer, thunder point, virgin river by setaian. Bookmark the permalink.